Endowment with Waiver of Premium (WOP) is not a mere product innovation. Had it been so, we could have relegated it to the product design departments of the insurance companies. Why it needs to be a part of the reform of the retail financial products space is because it calls for changes in the statutes; the statutory treatment of insurance products needs to align with the fundamentals of insurance. On 28th June 2010 IRDA issued a circular (IRDA/ACT/CIR/ULIP/102/06/2010) mandating certain elements to be incorporated in all ULIPs to be offered for sale to the public commencing from September 1, 2010. One of these elements is “minimum sum assured” for all unit linked products (other than pension and annuity products) not less than 10 times the annualized premium. This was done to ensure that ULIPs are not turned into pure investment products. IRDA expected the Direct Taxes Code, 2010 Bill to follow this norm while extending tax incentive to insurance premia. However the draft Bill went one step further to raise the multiple to 20 times the annualized premium (Section 70(2)). The logic was obviously the same, doubly reinforced. The government wanted that the tax incentive be availed of for genuine insurance only. We shall not discuss here the rationale of providing tax incentives for insurance – why should public money be used (tax foregone) for promoting private insurance ? That is an entirely different issue, and we shall revisit it some day. What I wish to contest today is the term “sum assured” used by the IRDA circular and the term “capital sum assured” used by section 70 of Direct Taxes Code, 2010; both these terms refer to “sum assured” (SA) as defined under Annexure I(1) of Guidelines for Unit Linked Life Insurance Products, 2005. The spirit of both the statutes, IRDA circular of 28th June 2010 and section 70(2) of DTC is to ensure purity of insurance. That raises a fundamental question : what constitutes insurance ? Insurance is a device whereby two entities, the insurer and the insured, enter into a contract to transfer risk from the latter to the former. Prior to the contract of insurance the prospective insured carries a risk : that he may die causing financial distress to his dependents. Through an insurance contract he transfers this risk to the insurer or, more correctly, to a pool of similarly placed insured. So risk and risk transfer are the defining attributes of insurance. Now the question is : does SA constitute the entire risk cover that the insured seeks through insurance ? As seen earlier, SA cannot be deemed to be the entire risk cover sought by an insured; we know that there exists another component in risk cover of an endowment with WOP, in addition to SA – the future premia payable by the insured, which the IRDA circular and DTC need to accommodate while specifying the multiple of premium. Both the statutes deviate from the standard procedure followed by an insurer to calculate the risk premium; insurer does not calculate risk premium on the basis of SA alone. Because the risk the insurer assumes on behalf of the pool of insured is more than the SA; he calculates the risk premium on the actual sum he is liable to pay on death of the life assured – the “sum at risk”. And what is sum at risk ? In case of a pure term policy the sum at risk is equal to Sum Assured. But in case of an endowment plan with WOP, the sum at risk is SA (if any) plus the present value of the future premia payable by the insured. 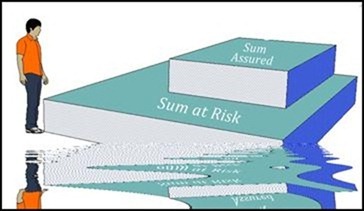 Sum at risk, therefore, is the correct measure of the risk cover sought by an insured. This is just one instance of the need to align the statutory treatment of insurance products with the fundamentals of insurance.